It is of the utmost importance for us here at, LocalBozo.com to update you whenever new information is brought to our attention regarding events we both cover and promote. 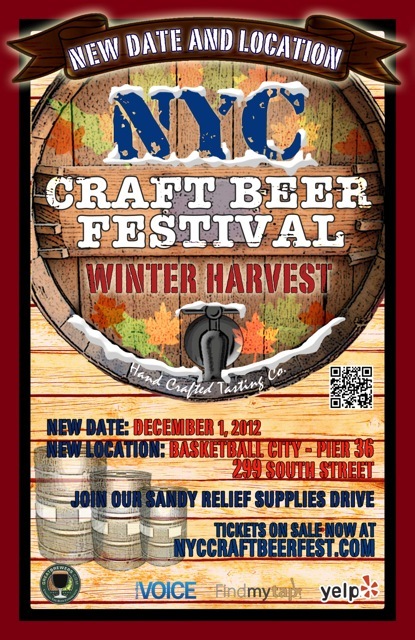 Therefore please take note that, “The NYC Craft Beer Festival – Winter Harvest Edition”, featuring Winter Craft beers has moved its Craft Beer tasting to the Basket Ball City venue, Pier 36. Pier 36 is located at the intersection of South Street and Montgomery Street (off the FDR Drive). If you have purchased tickets, or still need to remember the new date is: Saturday, December 1st, 2012. The great people behind this production have also added a Hurricane Sandy Relief Supplies Drive to do their part to help those effected by the storm. “Our thoughts and prayers go out to those in our region who were affected by Hurricane Sandy. The loss of life, homes, memories, prosperity is unfathomable. It is with this in mind, and the long recovery ahead for the region, that we postponed the NYC Craft Beer Festival – Winter Harvest, till Dec. 1st. to give people and the tri-sate area a chance to restore some order. We will also use our event planning experience, manpower, and trucking to harness the power of the craft beer community to collect needed supplies for the victims of Hurricane Sandy,” said Ken Tesler, the Producer. We at LocalBozo.com are more than happy to spread the word about the Sandy Relief Supplies Drive, new location, and date for the beer festival. Please visit their website for more information about the Sandy Relief Supplies Drive, and help in any way you can. Thank you and cheers!